DEATH VALLEY, Calif. (Reuters) – California’s Death Valley National Park, famed for its record-breaking heat, is keeping its visitor center and some restrooms open during the partial U.S. government shutdown with donations from a non-profit group and two hotels, a spokeswoman said on Thursday. The Death Valley Natural History Association is funding salaries for a handful of rangers to work at the Furnace Creek Visitor Center, park spokeswoman Abby Wines said. Two hotels were covering the costs of keeping the toilets open. “I’ve been at a national park for every one of these shutdowns, so I know that there’s a possibility they’re going to happen and we tried to prepare for them. Weren’t quite prepared for one to last this long,” the Death Valley Natural History Association’s executive director, David Blacker, said. Blacker said the association has enough money to keep the visitor’s center open through the end of January and perhaps into February. U.S. national parks have not been given a blanket order to close during the partial U.S. government shutdown over President Donald Trump’s demand for a border wall, which stretched into its 20th day with no sign of new talks to resolve the impasse. But most rangers, who are federal employees, are not being paid, meaning some parks have been closed to the public. Others have kept gates open but have been unable to provide services. Joshua Tree National Park, also in the California desert, announced this week it would stay open after determining funds from recreation fees could be used to pay maintenance crews. Bryce Canyon National Park in Utah said its visitor center would remain open until Thursday due to a donation from a non-profit group. 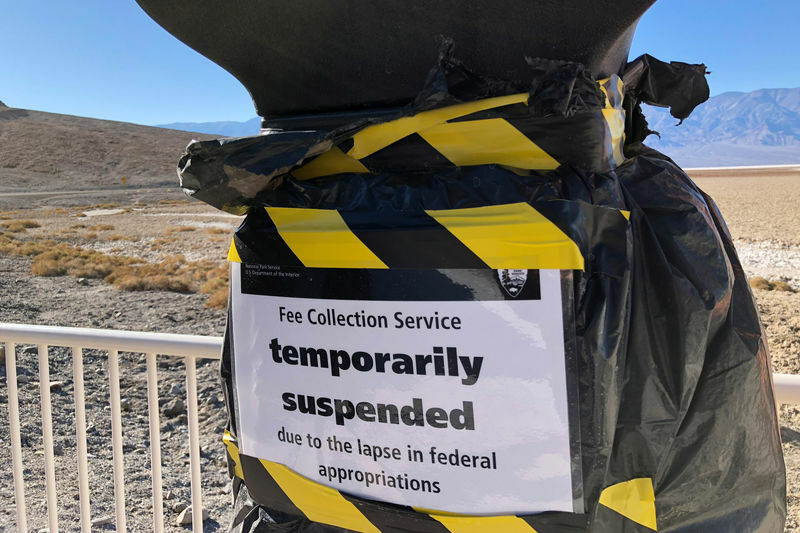 At Death Valley National Park, visitors who arrived on Thursday were unable to pay the $30 entrance fee and found scenic drives and sights like the historic Harmony Borax Works closed. William Bjorge, 58, and his wife Francesca Zonin, 56, had planned to camp in the park for two nights on a road trip from their home in Santa Cruz, California to Savannah, Georgia, but discovered the campsites closed. “I’m hoping that these places that are affected really close down completely, because then it will really show everyone what damage this (shutdown) does,” he said. Adam Greenhaus, 25, took a trip to Death Valley after his hours were cut at a hotel near another national park – southwest Utah’s Capitol Reef National Park. “I think it’s ridiculous. I think that national parks need protection whether they want to argue about other things in Washington or not,” he said. Wines, the Death Valley Park spokeswoman, said a few law enforcement park rangers are working but parts of the park are closed to protect ecologically and culturally sensitive areas.